This item is part of custom order the sofa has 70 fabrics to choose from them and a choice of 50 fabrics for two pillows. Please note that the order time is 3-4 weeks from the invoice date for either pick up in the store or for delivery if requested for a fee. This is a custom order, made in USA modern sofa for a contemporary living room and available in sofa, chair, loveseat, sofa bed and ottoman sizes. 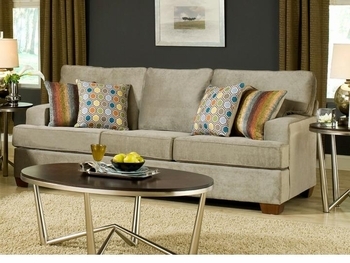 This style sofa is a product of USA made in North Carolina for contemporary, modern and younger look home furniture. The frame is constructed from hardwoods, double-doweled and glued, form a strong, sturdy and long-lasting foundation. All frames have a 5 years warranty. The back cushion is made of High quality polyester fibers, Back cushions are channel sewn to maintain optimal comfort and appearance and filled with high quality polyester fibers. The seat cushion is made of High Resiliency (HR) 1.9 minimum density foam, wrapped in multiple layers of polyester fiber and encased in a non-woven ticking material. Fabric shown: please note that many other fabrics are available for this style and all of our fabric swatches are available to browse in the store. Pillows fabric: please note that many other fabrics are available for this style and all of our fabric swatches are available to browse in the store.